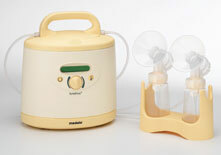 The Breastfeeding Boutique offers a full line of Medela® Breastpumps & Accesories for purchase or rent. Effective January 1, 2005, in compliance with Medela's Distribution Policy, we cannot list our prices on our website for Pump In Style breastpumps. Please call 561-338-3322 or E-mail Jennifer Jones for the absolute lowest prices. Please call (800) 229-9661 or E-mail Jennifer Jones for the best Internet prices. 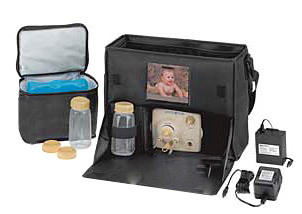 Pump In Style® is the #1 selling personal use breastpump. Pump In Style® comes in a stylish black shoulder bag and contains all you need for convenient and comfortable pumping and storage. Extra breastpump kits & accessories sold separately. 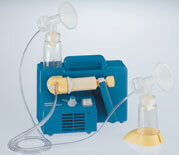 Pump In Style® is the #1 selling personal use breastpump. Pump In Style® comes in a stylish black shoulder bag and contains all you need for convenient and comfortable pumping and storage. No kit included. 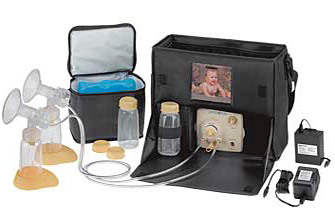 Extra breastpump kits & accessories sold separately. Pump In Style® Advanced is the only electric retail pump with Natural Expression™ technology, proven to reduce pumping time and designed for faster let-down and milk flow. Offers electric or battery power and double or single pumping options. Available in a sporty backpack or stylish shoulder bag. Extra breastpump kits & accessories sold separately. 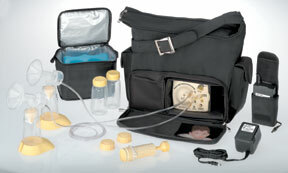 Pump In Style® Advanced Traveler is the #1 selling personal breastpump in a unique microfiber backpack. Offers electric or battery power and double or single pumping options. Now the best for your baby is easier than ever. 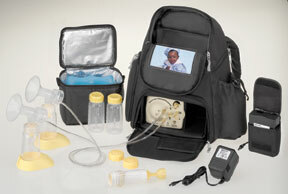 Extra breastpump kits & accessories sold separately. 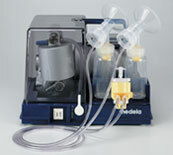 The Medela® Classic Breastpump is the original breastpump, ideal for allowing you to provide your baby with breastmilk. Use for electric double or single pumping. Extra breastpump kits & accessories sold separately. The Choice of healthcare and lactation professionals for over 25 years! Lactinas are hospital-grade breastpumps that set the standard for the industry. Lactina Select® and Lactina Plus® are ideal for short- or long-term use. Electric motor with battery option. Double or single pumping. Extra breastpump kits & accessories sold separately. The Symphony® offers breakthrough Natural Expression™ 2-pattern pumping that mimics the way your baby nurses. The ultimate in comfort and flexibility, Symphony offers: electric or battery option, double or single pumping and ultra-quiet performance. Extra breastpump kits & accessories sold separately.